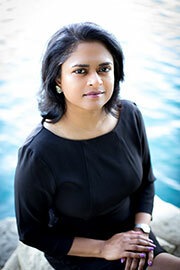 Amulya Malladi is the bestselling author of seven novels, including The Copenhagen Affair (2017), A House for Happy Mothers (2016), The Sound of Language (2008), and The Mango Season (2003). Her books have been translated into several languages, including Dutch, French, German, Spanish, Danish, Romanian, Serbian, and Tamil. Malladi has a bachelor’s degree in engineering and a master’s degree in journalism. When she’s not writing, she works as a marketing executive. After several years in Copenhagen, she now lives outside Los Angeles with her husband and two children.